Paper size: 50 x 64 cm. 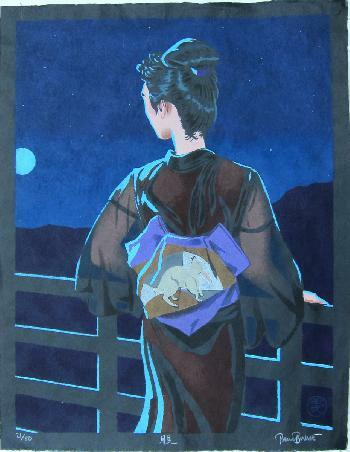 Stencil print (kappazuri-e) showing a girl looking at the moon, done in February 2011 in an edition of 80. Note the silver on the obi (and the rabbit! ), and the transparent sleeves. This print has been done on black paper like Paul's earlier kappazuri-e done more than 15 years ago.